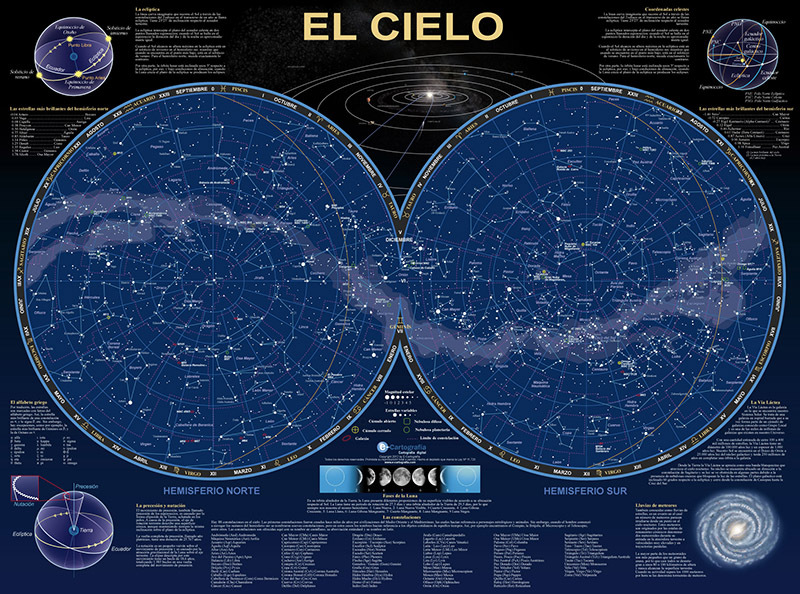 Description: sky map poster that includes 2,844 stars and other celestial objects in both hemispheres up to magnitude 5, which corresponds to the brightness that can be seen with the naked eye. - The 88 constellations with their respective limits and their names in latin. Stars are classified according to their brightness using the Greek alphabet. - Explanations about the ecliptic, the Milky Way, the celestial coordinates, meteor showers, the Solar system and a list of the 10 brightest stars for each hemisphere. Size: DIN-A (42cm x 29.7cm). Languages: English, Spanish, and German. ©2019 E-Grafikwerk - All rights reserved.